Photos on my phone and my laptop both say this at the bottom of the People section of the app. There has been no noticeable progress made in the past few weeks. It looks like all the people it has "identified" were carried over from when I manually tagged them in iPhoto years ago. Is there a way to jumpstart this process or restart it? Launch the Photos app on your Mac. Select the picture that has the person's face you want to create a profile for. Click on the Info button on the top right side of the Photos window. It looks like an i with a circle around it. Click the Add button next to Add Faces. Relocate the tag circle to the face of the person you want to create a profile for. Click on Click to Name. Name the person. If the name is in your contacts, it will appear in the suggested list. Click the Close button in the info window when you're done. Click on the People album in the sidebar under Library. Select the new People profile. 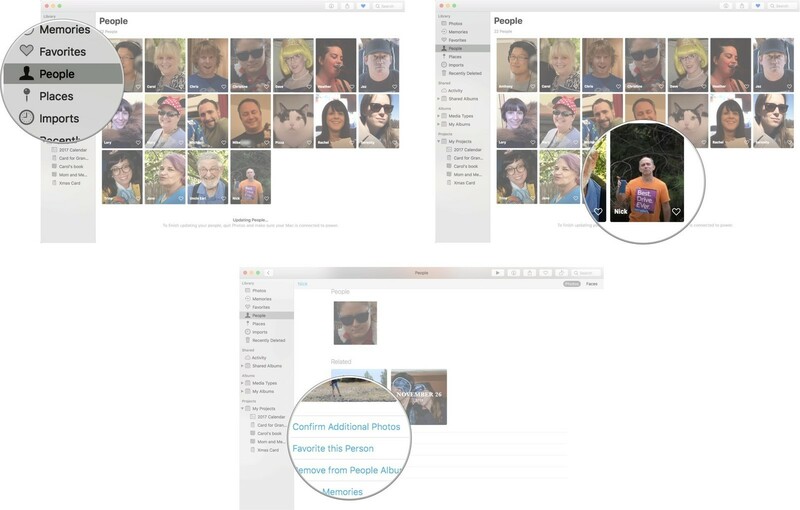 Click on Confirm Additional Photos to see if the Photos app has automatically registered any additional pictures with that person in it. Not the answer you're looking for? Browse other questions tagged macos ios photos.app . Is there an efficient way to recover un-synced Photo Stream images? What is Photos doing when it says “Updating”? How can I unmerge people in Photos?